Dell is betting on Android and Windows 7 tablets to counter the surge in popularity of the Apple iPad. A leaked roadmap suggests Dell has in store two Windows 7 tablets and a 10-inch Android Honeycomb tablet for release later this year, as the company aims to grab tablet market share. 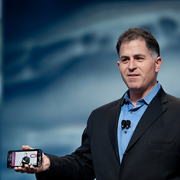 But despite keeping allegiance to Microsoft with Windows 7, Dell CEO Michael Dell says Android tablets will one day dominate the market. The three Dell tablets, detailed courtesy of a presumed roadmap leak to the AndroidCentral blog, are reportedly set to arrive later this year, with the Android tablet, dubbed "Streak Pro," as early as June. The Streak Pro specs list a 10-inch display (1280 by 800 resolution), an Nvidia 1.2Ghz dual-core processor, with two microphones and two cameras for video recording and chatting, running on Google's Android 3.0 Honeycomb OS for tablets. Dell won't go for a stock Android UI, but use instead its Stage 1.5 user interface. The two Dell Windows 7 tablets are set to follow the Streak Pro: the 13-inch Latitude XT-3 in July, and the Latitude ST in October. The Latitude XT-3 will be a convertible tablet (like most pre-iPad tablet offerings), with Intel CPUs, 2GB of RAM, and a stylus, powered by Windows 7. The Latitude ST will feature an iPad-like design, an Intel Oak Trail 1.5Ghz processor, 2GB of RAM, up to 128GB SSD storage, dual cameras (1.3 megapixels front and 3 megapixels rear), claiming eight hours of battery life. Note that the leaked Dell roadmap is on par with an earlier leak, from the same blog in February. It's unclear though why Dell insists on making Windows 7 tablets, especially as the company's CEO believes Android tablets will dominate the tablet market in a few years, like Android smartphones do now. Dell said in an interview with the Wall Street Journal on Sunday about Android tablets outpacing iPads: "Not tomorrow. Not the next day. But again, if you look at 18 months ago, Android phones were like, "What is that? "And now there are more Android phones than iPhones. I don't see any reason why the same won't occur with Android tablets." Dell also said that in the four years he has been back at the helm of the company, the sudden rise of the iPad took him by surprise: "I didn't completely see that coming. Tablets aren't really new, in the sense that the tablet PC idea's been around for a while. Obviously, more recent products have been much more successful." Dell has already tried its hand at Android tablets last year, with little success, with the 5-inch Streak, a clunky hybrid tablet/smartphone. Marred with old software, high pricing and negative reviews, the original Streak was widely seen as a flop. The company also unveiled a 7-inch Streak tablet in January, running Android 2.2. Dell also experimented with a 10-inch tablet/netbook hybrid last year, called Inspiron Duo, running on Windows 7.